I took a couple of machine shop classes and got spoiled by the X-axis power feeds on the Bridgeport mills. Ever since then I have thought about adding one to my Harbor Freight Mini-Mill (Sieg X2). Beside reducing wear and tear on your arm and the boredom of turning and turning and turning a wheel, a power feed can produce a better finish on your parts because it moves the table at a more uniform speed than you probably can. It will also feed much slower than your own patience may allow, for those times when a very slow feed rate is called for. A power feed can also improve your productivity. Many of them have a rapid feed (traverse) button which can zoom the table back to the starting point much faster than you can by turning a wheel. It can also give you some extra time to study your plans, make calculations and think about your next operation, although I am not recommending you let one run unattended. You can buy power feeds specifically designed for the Sieg X2 and X3 mills. Littlemachineshop.com sells one for the X2 in a number of different configurations for about $180 and Micro-Mark sells it without a feedscrew for $196. I have heard from multiple sources that the X2 feed works, but it could use a more powerful motor. It also does not have a rapid feed capability. LMS and Grizzly sell the same power feed for X3 and Super X3 mills for $230 and $320 respectively. It does has a rapid feed button and you can learn more about it by downloading the owner’s manual on Grizzly’s site. I have not heard anything about how well they work. If you have one, please leave a comment and let us know. Of course, people with machine tools like to build things and some have made their own power feeds. I am very impressed with the one Keith Marshall made from an inexpensive Harbor Freight cordless drill. He reused the drill’s electronics for controlling speed and direction but added external controls mounted on a control panel, including a rapid feed button. The drill’s clutch is used to prevent damage if the table is run to the end of its travel and his design includes a quick release that disconnects the power feed if he wants to use the manual feed wheel. The connector he machined to attach the motor to the feed screw looks easy to make, although if your mill has an older “short” feed screw, you may have to buy a replacement from Littlemachineshop.com for about $21. Power is supplied by a 12-volt power supply for a portable electric cooler. The choice of power supply for any kind of homemade feed may require some careful consideration, because almost any kind of suitable motor is probably going to require more voltage and current than the typical easy-to-find “wall wart” can supply. You also have to consider electrical safety and use proper sized fuses and wiring to avoid a fire caused by overheating. I have an extra cordless drill and I’m really tempted to see if I can build a power feed as good as Keith’s, but I have decided not to. I bought my mill because it came with a CNC conversion kit that the previous owner never used. I held off installing it for a couple of years because I wanted to learn how to use the mill manually first, but I have just started the conversion. Addendum (11/17/2010) – I removed some information about Harbor Freight’s power feeds. They no longer seem to sell them. Most of the “mini-mills” are made by Shanghai Sieg Industrial in China. The differences are mainly paint color, accessories, spindle style (R8 or MT) and the amount of “dealer prep.” IMHO, the cheapest way to get a Sieg mini-mill is to buy one from Harbor Freight. They sell the least expensive one to begin with, and if you can get buy one at one of their stores you’ll save on shipping charges and be able to use one of their 20% off coupons, which are pretty easy to find in magazines and newspapers. I heard on a discussion group that the mills have been hard to find. You may want to call the store and see if they’ve got one in stock that hasn’t been on display. If they don’t then you might ask them if they can get one for you. I think they’ve been selling for about $450. The “best quality” mini-mills might be the ones sold by Grizzly. They’re basically the same as the HF, but their fit and finish seems to be better. Grizzly also has very good customer service. But you’re going to pay more. I don’t know who else in selling them right now. (I’m assuming you’re in the US). Mike built a really nice power feed for his micro-mill. 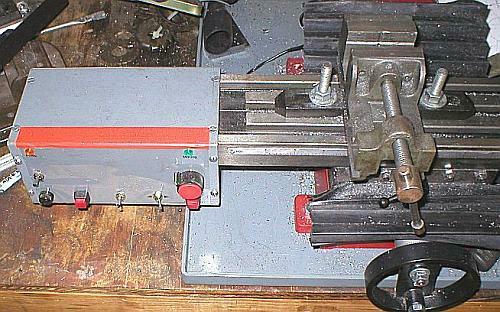 He also has a very interesting web site that shows lots of useful mini-lathe, micro-mill and 4×6 bandsaw modifications. Jeff, looks good. Check back in after you’ve used it a while to let us know about the positives and negatives. I have been interested in one for a while, just haven’t pulled the trigger on the components.